Middle name is actually Gottlieb (chosen by God). Later in life, partly in jest he adopted Amade, the Latin version of Gottlieb. After his untimely death his followers elevated the word to the more hagiographic Amadeus. Extraordinary child prodigy; started keyboard at age 3; started composing minuets at age 5; concertized throughout Europe at age 7–10, playing to kings and royalty, astounding audiences. Age 15 (1772), he became concertmaster to the Archbishop of Salzburg. Age 25 (1781), resigned Salzburg post, moved to Vienna and became a freelancer. It was a bad career move at a time when musicians vied for top spots in Europe’s highest courts. The move also strained his relationship with his stage-father. Age 26 (1782), married Constanze Weber, a commoner from a Mannheim musical family. The late 1780s was a financially difficult time for Mozart. 1788-91 was a troublesome time in Austria; a war with the Ottoman Turks weakened the state and depleted the treasury. This, in turn caused serious financial difficulties for Mozart whose aristocratic patronage diminished. In1788 Mozart survived by borrowing money from Michael von Puchberg, a wealthy textile merchant and a friend. Yet his compositional output was strong. Symphonies # 39, 40 and 41 were composed in the summer of that year. By 1790, depressed and sick, his compositional output would reach a nadir. In 1791 Mozart’s career reinvigorated. Requiem commissioned. Mozart began composing the Requiem in October 1791. He did not finish it. Mozart died December 5, 1791, at age 34. In the last three years of his life Mozart did not produce any new symphonies. The reason for this peculiar decrease in output is unclear. Some speculate it had to do with the practical, commercial realities of his professional life as a free-lancer. He had to compose whatever sold best. The output of other composer’s provides support for the latter argument. In the late 1700’s many composers, most now unknown, produced >50 symphonies; Haydn produced 104. Yet in the 1800s we find much less: Beethoven, Dvořak, Bruckner, Mahler, Schubert: 9 each; Mendelssohn: 6; Schumann & Brahms: 4 each. Leopold Mozart’s death (1787) deprived historians of written records. Previously Wolfgang’s letters to his father had been a rich source of facts. Thus there is very little known about the genesis of the symphony. Thus music historians have difficulty recording the reception of his symphonies, something that became easier in the post-Beethoven Romantic Era. Mozart composed six symphonies in Vienna: Haffner (#35) 1782, Linz (#36) 1783, Prague (#38) 1787. The final three, #s 39, 40, 41 1788. The final three were entered into Mozart’s catalog in the summer of 1788: #39 June 25; #40 July 26; #41 August 10. It is thought that these were intended for a concert that never took place. Whether Mozart ever heard these three performed is a matter of controversy. So is the idea that Mozart may have intended these to be a trilogy. The title is derived from a convoluted sequence of quotes, mainly via Mozart’s son Franz who quoted violinist and impresario Johann Peter Solomon (1745-1815) as having coined the nickname. In 1829 (38 years after Mozart died), Franz told a visitor, Vincent Novello ( English composer & publisher), that the finale to his father’s Symphony in C was the highest triumph of instrumental composition. He also mentioned that Solomon had christened the Symphony Jupiter. It receives a soft, lyrical response from the first violins. The gesture is then repeated, the violin response sequenced up. The main body of Theme 1 follows, a vigorous, martial sounding, tutti It comes to a closed cadence and a pause. A rising melody in woodwinds, then falls comically. It receives a quiet response from violins. The woodwind gesture is repeated with another violin response, sequenced down. Strings extend the violin response in a quiet passage. The coup d’archet abruptly returns and leads to a lengthy, loud passage based on Theme 1 material. It ends in an open cadence. NOTE: The events of this passage parallel that of the very beginning, the opening coup d’archet & Theme 1. Some consider this section to be a varied re-statement of the Theme 1 complex. A pretty 4-square melody in first violins, accompanied by a see-sawing ostinato in second violins. The theme is extended in a quiet passage that features a conversation between the upper and lower strings. The passage quietly dies down to a pregnant pause. Pleasant mood is suddenly interrupted by a loud C-minor passage in orchestra. The music proceeds vigorously, initially in a dark mood, then back to C major, still vigorous, with Theme 1 material. It comes to another open cadence and pregnant pause. A popular style, arioso theme in strings, easy to remember & whistle. It has a repetitive antecedent and a single consequent, with the following phrase structure: a – a’ – a’’ – b. NOTE: This theme is a direct quote from a passage in a concert aria Mozart composed in 1788, Un bacio di mano. Another vigorous tutti passage follows with a closed cadence reminiscent of Eine Kleine Nachtmusic. In keeping with Classical Era tradition, the Exposition is repeated verbatim. PART 1: The aria developed. After a brief wind transition, the arioso Closing Theme is repeated in E-flat by violins with a pedal accompaniment in winds. The tail end of the tune is echoed in winds. This leads to a tutti passage that develops this motive. A quiet wind and string transition on the same motive. PART 2: Transitional Theme developed. A quiet, string version of the opening coup d’archet receives its response with the comic falling idea of the Transitional Theme in bassoon counterpoint. NOTE: This passage gives a false illusion of Recapitulation. Transitional Theme is sequenced up in woodwinds with the coup d’archet in counterpoint..
PART 3: Wind transition on Closing Theme motive. The tail end of the aria returns in a brief wind passage with sustained horns. This provides a transition to Recapitulation. Theme 1 (C major) returns verbatim. The Transitional Theme returns in variation. The loud Bridge that begins with a coup d’archet does not need to modulate. It is thus slightly different that its Exposition version. Theme 2 returns in the home key of C major. The C-minor shock returns in variation, in F minor, still shocking. The vigorous passage that follows is in D major. The Closing Theme derived from Un bacio di mano returns in the home key, C major. The vigorous tutti passage that follows is slightly varied from its earlier version, serving a concluding function. NOTE: There is no distinct Coda. The opening coup d’archet, and the response that follows, has been described as formulaic for Mozart. Given the multiplicity of moods and expressions in the first movement, based on the quote above from Mozart himself, the expressive aim of the movement may simply have been to be a crowd-pleaser for a diverse audience. The lines of the musical narrative are clearly demarcated by well marked cadences and pauses. This is a typical feature of Classical Era music. Mozart gives his concert aria some “prime time” exposure in the development. It occupies nearly half of the section. The theme unfolds over ten measures, and in five phrases: a-a’-b-c-c’. Phrases a & a’ are in muted violins. Phrase a is a soft, slow, rising-falling antecedent with dotted rhythms; it receives an incomplete reply from the orchestra: a single loud chord. Phrase a’ is a repetition of a, sequenced up. NOTE: Elaine Sisman points out that a & a’ carry a Sarabande rhythm. A Sarabande is a Baroque Era triple meter dance, slower than the Minuet, with emphasis on the second beat. Phrase b is an extension of the a motive in upper strings, with figurations. Phrases c & c’ are yet more elaborate extensions of a with wind figurations. Phrase a reappears, now in the basses, with a pulsating bassoon in accompaniment. It is followed by a’’; the phrase is sequenced differently. A new passage, Phrase d, features leisurely, lyrical figurations in upper strings. It ends in an open cadence. NOTE: Neither version of Theme 1 is “complete.” The antecedent posed by Phrase a is never fully answered. Suddenly and unexpectedly the music changes to the key of C-minor. Phrase am is a variation of It begins in unaccompanied oboe & bassoon and receives a loud response: a single orchestral chord. Phrase am’ sequences am, and now also features a heartbeat-like accompaniment in strings that adds to the pathos. Phrase am’’ is an extension in full orchestra, loud and with repeated orchestral chords hammering away at the tragic mood. The music returns to a more lyrical mood in a transitional string passage. This passage parallels a similar C-minor shock in Movement 1. Mozart gives this anguished passage a good deal of importance. The Development will be almost completely devoted to it. Most bridge sections in Sonata Form movements tend not to be of crucial expressive importance, remaining secondary to the main themes. The dramatic importance of this particular Bridge is therefore striking. A lyrical tune, Theme 2 comes in the dominant, the expected key. It is in five phrases: a-a’-b-b’-b’’. Phrase a features a rising melody in oboe & bassoon answered by a staccato triplet in flute and horn. Phrase a’ sequences the melody up. Phrase b is a violin melody that utilizes both motives. Phrases b’ & b’’ are extensions of this melody with increasingly elaborate figurations. Brief, six measures. Features a Closing Theme and transition to Development. The Closing Theme is a quiet, lyrical four-square melody; a-b-a’-b’. Phrase a is an antecedent in violins that begins with a three note rising idea and continues with a brief ornate figuration. Phrase b, the consequent, in flute & oboe, is an inversion of the three notes, followed by figurations. Horns provide a pulsing accompaniment. Phrases a’ & b’ provide a satisfying conclusion to the tune. NOTE that unlike Theme 1, the Closing Theme does have a conclusion. Unaccompanied violins, still muted, provide a lyrical transition full of triplets. In keeping with Classical Era tradition the score calls for a repeat of the Exposition. Phrase am from the Bridge section returns with all its anguish in D minor. Phrases am’ & am’’ follow, the series of mournful orchestral chords going through different key areas. Ends in a codetta on a six note figuration. The codetta is used as transitional music echoing in different instrument groups, strings, horns and winds. The transition is quiet and peaceful, calming down the anguish of Part 1. NOTE: The main expressive element of the Development is a return to pathos with the Bridge music. Theme 1 returns in the home key of F major, but is altered. Phrase a is stated by violins only once. Its single, incomplete consequent is no longer a loud orchestral chord, but a soft staccato note in violins only. Phrases a’ & b are absent. Instead a variation of phrase c, scale figurations in basses and violins, provides a developmental end to the theme. Phrase a, soft in basses, followed by brief Phrase d, figurations in strings. The music seamlessly transitions into the Bridge. The dramatically varied presentation of Theme 1 is unusual for a Classical Era Recapitulation. So is its expressive purpose, essentially developmental. Mozart is presenting us with a development of Theme 1 that should have occurred in the Development section, not in Recap. These gestures are to be found in the Romantic Era, decades after Mozart. This movement is therefore significantly ahead of its time. This is substantially truncated, and devoid of any shock effect. After the extended treatment this music received in Development, repeating it here would have been redundant and boring. From this point on, the movement follows the Classical formula. Theme 2 returns verbatim in the home key of F major. The Closing Theme returns, slightly varied, in F major. The transition is truncated to only one measure. The original Theme 1, the one missing from Recap, returns with phrases a- b-c’. This makes for a satisfying conclusion.. The movement ends with repeated horn octaves and figurations in violins and oboe. Mozart’s Cantabile designation for this movement is his only one in his slow movements. This is a feature not found in earlier Mozart symphonies. It is however, present in the slow movements of his piano concerti of 1784-86 (#s 14-25). The first theme is “never allowed to end,” says Sisman. In its first appearance it is interrupted and made to yield to figurations. On the use of Sonata Form: In the Classical model, second movements do not have to belong to any particular form. The composer can do with them as they wish. High degree of expressiveness of the Exposition Bridge. Non-verbatim return of Theme 1 in Recap. The secondary development of Theme 1 in Recap. The abbreviated Bridge in Recap. Why the secondary development? Why not develop Theme 1 in Development? It seems that Mozart wished to have the deep pathos of the Bridge music to stand out on its own as a distinct expressive element of the movement, without dilution by other music. Begins as a quiet melody, an antecedent, stated twice. The melody, in violins, has a see-sawing accompaniment. Its tail end, highlighted by brass & tympani, has a somewhat regal feel. NOTE: Most of Mozart’s Minuets start forte; this one starts piano. The consequent is louder, in whole orchestra, with a convincing conclusion. This is closely related to Phrase a, louder, longer and more elaborate. It begins with an extension of Phrase a in winds and strings. It then gets louder and more ceremonial with dotted rhythms, and with a passage that develops the main motive of Phrase a. The quiet antecedent is a variation; in oboe with a counter melody in bassoon. The louder consequent is repeated verbatim. This is a quiet, thin textured, four-square melody. Begins with a quiet two note rising antecedent in flute with a long-short rhythm. The consequent, in oboe and violins, is a playful, falling melody. The antecedent-consequent is repeated, the latter providing a conclusion. A brief turn of phrase provides transition. NOTE: The two note antecedent is an inversion of the cadential gesture of the Minuet that preceded it. This detail has attracted some scholarly attention. The two note cadential figure of Phrase a is extended and developed in a loud, agitated, A-minor passage. Strings provide an um-pah-pah accompaniment. This sudden eruption of angst parallels prior ones in Movements 1 & 2. Brief transitional passage in strings; more peaceful. Slight variation on Phrase a.
Melody is the same. The ending is louder, scored for more wind instruments. In keeping with Classical tradition, the Da Capo is abbreviated, the various phrases identical to those of the first Minuet. Despite the forward looking features of Movements 1 & 2, and Movement 4 to be described below, Mozart delivers a conventional third movement that adheres to Classical tradition in every way. Perhaps the only slight variation is the angst of the b phrase of the Trio. Within fifteen years, Beethoven would begin making mincemeat out of the Minuet & Trio beginning with his Symphony #2 of 1803 where, for the first time, he called his third movement a Scherzo. The word means “joke” in Italian. The Scherzo was Beethoven’s joke on the Minuet and it took hold for the rest of the 19th century. Mozart does not seem to have anticipated this development. I wonder what Mozart would have thought of Beethoven’s Scherzo had he survived into the 19th century. My bet is he would have loved it and embraced the idea wholeheartedly. In this movement Mozart delivers yet another Sonata Form structure but the music features the complex polyphony of an era bygone to Mozart. The polyphony is built on five basic motives which will be described in order of their appearance. Motive a: A four note rising idea presented initially in first violins. NOTE: Motive a is a common melody that goes back to Gregorian chant and has been ubiquitously used from Palestrina to Brahms. Mozart used the melody in his very first symphony (1764). Motive b: Antecedent: “. . . – “ rhythm. Three repeated staccato notes followed by a long note. Consequent: a fast figuration. Motive c: A closing fanfare, a martial dotted figure in winds & brass, followed by a descending configuration of eighth notes in strings, in canon. NOTE: This Motive c is a recurring feature of the movement, easily heard within many complex polyphonic passages. It often functions as a cadential (concluding) figure. Motives a & b, soft, in first violins with a 2-note ostinato in second violins. Motives a & b repeated, loud, in orchestra. Motive c in winds & brass. It is then extended in full orchestra. Motive a returns as a quiet three part fugue in strings. The imitative entries of the fugue progress from high to low strings. A loud, polyphonic passage in tutti. A new Motive d, the Bridge Motive, consists of 3 rising staccato notes followed by a trilled, dotted figure. Passage begins with Motive a. Motive d in strings, is added in counterpoint. Motive c provides a cadential gesture, the fanfare in stretto. Stretto: a term used for fugues; a succession of overlapping statements of the fugue subject, especially towards the final section. In post-Baroque polyphony, stretto applies to motives repeated in close succession, overlapping with each other. Main element of this theme is a new 3-note Motive e.
Motive e quiet in strings with echoes of the Motive c in flute, repeated twice. NOTE: this is a polyphonic passage, Motive c in counterpoint. Quiet polyphonic passage: stretto on Motive d, followed by a stretto on e.
Sudden rise in volume: polyphonic passage, 4-part stretto on Motive e.
Music continues with great momentum straight into the Closing Section. Loud & energetic; begins with polyphony based on Motive b. Continues loud & polyphonic: developmental material based on Motive c.
NOTE: This includes both the original motive and its inversion. Ends with a “Mannheim cadence”: the music suddenly & dramatically quiets down on two statements of Motive c, first in oboe, then bassoon. This refers to an outstanding orchestra that existed in Mannheim, its accomplishments peaking in the second half of the 1700s. It was influential in the evolution of Classical Era music. It’s “father” was Johann Stamitz (1717-1757). He is credited for creating the 4-movement symphony, adding the Minuet & Trio to the previously 3-movement model. The Mannheim Rocket: A swiftly ascending passage, usually a rising arpeggiated line in crescendo. The Mannheim Roller: Extended crescendo, usually a rising melody over an ostinato base. The Mannheim Sigh: Putting more weight on the first two notes of descending pairs. The Mannheim Birds: Imitation of birds chirping in solo passages. The Grand Pause: Playing stops for a moment, total silence, before resuming vigorously. The Mannheim Cadence: A high energy section of music where all instruments drop out, except for strings, usually preceded by a Mannheim Rocket. Mozart visited Mannheim from 1777 onwards and was much impressed by the orchestra. Part 1: Motive a contrasted with Motive c.
Motive a in strings is answered by Motive c in oboe & bassoon(G major). Music modulates to E major. Motive a in strings, answered by inversion of Motive c in flute & bassoon. Part 2: Loud polyphonic passage on Motive c.
The passage utilizes both Motive c & its inversion. Part 3: Motive a contrasted with Motive c.
Motive a, quiet in oboe & bassoon receives a vigorous c response in strings. The response is polyphonic. Stretto on Motive c & its inversion. This sequence is repeated in different key areas. Motive a in flute & oboe; Motive c inversion, compressed in strings. Motive a in flute & oboe; both Motive c & its inversion in stretto, in strings. Motive a polyphonic in winds, Motive c inversion in strings. Assertive polyphonic passage based on Motive c & its inversion. Begins quietly with Theme 1, Motives a & b stated in strings. NOTE: This is extremely truncated, compared to the Exposition. The passage begins with Motive a in first violins stated in C, D & E major. It continues with Motive a in stretto for the first time, in D, then in C major. NOTE: The unconventional, mostly developmental treatment of a truncated Theme 1, parallels the Recap of Movement 2. The Bridge returns as in the Exposition with Motive d and a stretto on Motive c.
Theme 2 reappears, in the expected key of C major, slightly altered from the Exposition. Quiet passage: Motive e is first echoed by Motive c (same as Exposition), then Motive d (variation). Loud passage, stretto on Motive e (same as in Exposition). Closing Section carries on the momentum (same as in Exposition) with Motive b, but in different key areas than in the Exposition. Closing Section continues with stretto on Motive c.
The Mannheim Cadence is varied: Bassoon plays an inversion of Motive c.Flute plays Motive c.
A loud, tutti statement of Motive c, ends in an open cadence. The Coda continues quietly in strings, with a stretto on an inverted Motive a. The section has a fugal beginning with Motive a in winds & Motive e in strings. The fugue then incorporates Motives c and d.
It continues with these four motives in polyphony, interchangeably appearing in different instrument groups. The Coda ends with loud homophonic statements of Motive b, then Motive c.
Loud concluding chords mark a triumphant finish. I omitted a fifth motive from my description, that participates in the final polyphony. This initially appears as part of the Theme 2 complex. It is a subtle motive that is hard to hear. Some have characterized this movement as a synthesis of sonata form and fugue. In the mid 18th century a style called galant had superseded Baroque music. This was part of a general galant movement in art. The word means elegant. Mozart is considered one of the major practitioners of this style. His Eine Kleine Nachtmusic is a good example. A return to simplicity and immediacy as opposed to the complexity of Baroque music. Melody driven music. Simpler, song-like melodies. Simplified harmonic language emphasizing the tonic and dominant. Clear distinction between the soloist and accompaniment. Thick textures (multiple simultaneous lines of music). 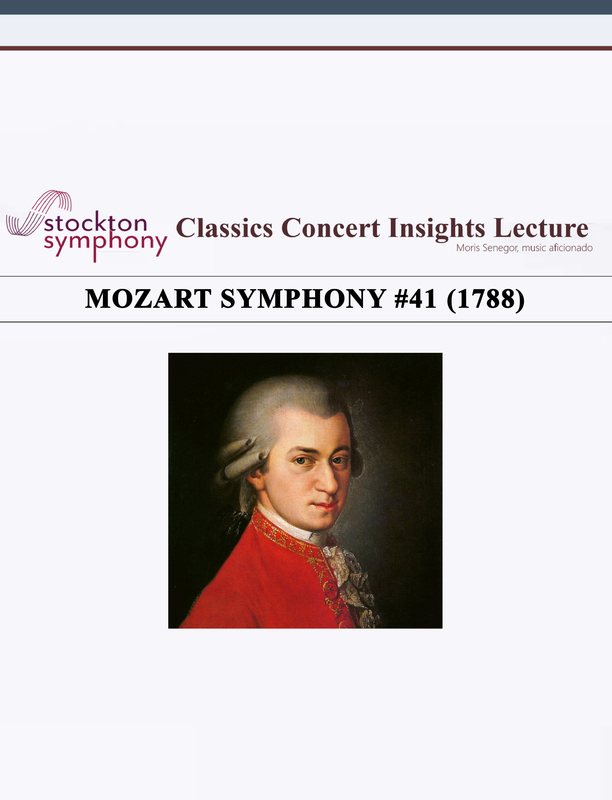 In the final movement of the Jupiter, his last symphony, Mozart, a famed practitioner of the galant style, returns to the old fashioned, complex, hard-to-listen-to, learned He does it with impressive skill and graceful energy. The result is unanimous praise from scholars and critics. In looking back at the Baroque, Mozart also looks forward. In the centuries that followed, some prominent symphonies also used a retrospective revival as a novel feature. Brahms Symphony # 4 (1885): The final movement of his final symphony is a Passacaglia, another Baroque procedure, in a quasi-Sonata Form format. Prokofiev Symphony #1 (1918) aka Classical Symphony, is a return to the Classical Era, emulating Haydn, but with modern inner workings.